LinkedIn have introduced a range of new features including a newly designed home page and Facebook style status updates. To coincide with the new features LinkedIn have signed a deal with Microsoft that has seen Bill Gates join LinkedIn! If you know his email address you can ask him to become part of your LinkedIn network ('Bill Gates is now a connection') - but he is not open to receiving referrals or InMail. 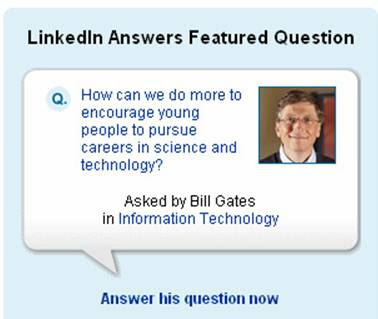 Bill Gates has also posted a LinkedIn user question entitled ‘how can we do more to encourage young people to pursue careers in science and technology?’ In 4 days Bill Gates' LinkedIn question has received over 3000 responses! This is a clever way of driving more LinkedIn traffic, especially as Microsoft have bought all the ad inventory on LinkedIn at the same time. A number of commentators believe that the next phase of social networking will be based around interest-specific social networking communities. Whilst sites like Dopplr (business travel) and WAYN (travel) are doing well, the enhancements that LinkedIn have added to their site could mean that they become the hub for virtual business networking. Interesting! Clearly Mr Gates must receive quite a few add to address book requests! :) I can see why more and more niche communities will become valuable going forward, especially in Business (linkedin.com, Xing.com) but also Travel vertical like WAYN.com.